Rogue One: A Star Wars Story is now showing everywhere and is distributed by Walt Disney Pictures. 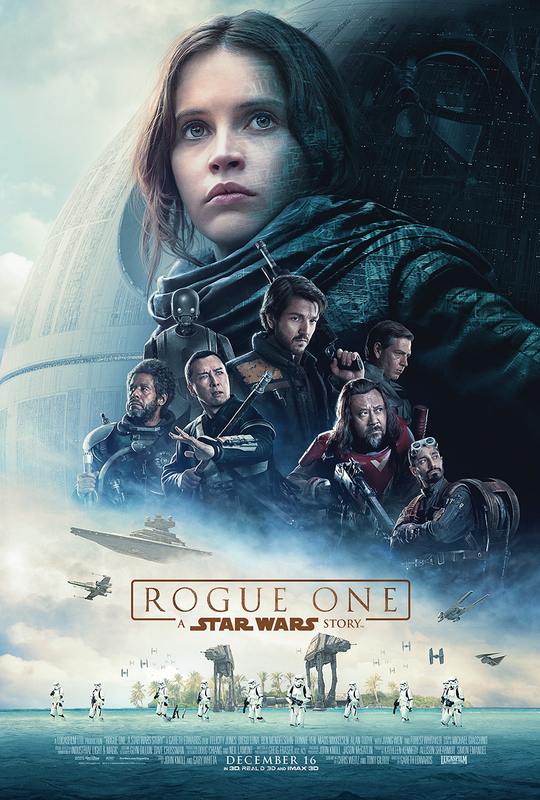 While Star Wars: The Force Awakens was an undeniable success, Rogue One brings forth the Star Wars film that people truly wanted to see with a brand new and original story that answers long held questions in the most spectacular and glorious of ways. Rogue One is what Star Wars fans were eagerly anticipating when Disney announced their plans to expand the Star Wars universe. The Force Awakens was a great starting point for kicking off the new series of films, but many complained of it's lack of originality because of how much it resembled A New Hope. Gareth Edward's film really does expand the Star Wars universe by opening it up to include more than just the Skywalkers and their family tales, and the screenplay by Chris Weitz and Tony Gilroy makes the most of this freedom while also staying true and respectful to the George Lucas films. Rogue One takes place right before 1977's Star Wars: Episode IV- A New Hope and focuses on the rebels who obtained the plans to the Death Star. Orphaned at a young age when her father, Galen (Mads Mikkelsen) is called upon to work for the Empire, Jyn (Felicity Jones) finds herself years later being recruited by the Rebellion. 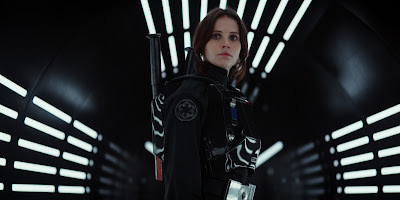 She discovers that her father has hidden the secret to bringing down the Empire's weapon, the Death Star in it's plans and she must lead a group of rebels into enemy territory to give them hope that the Empire and Darth Vader can be defeated. Rogue One is a film for Star Wars lovers. It fills a great hole that was left gaping when George Lucas completed his six episodes and answers the questions you never knew you had until you watched Rogue One. Fans of the Star Wars franchise will be delighted with several Easter Eggs throughout the film and also the inclusion of unused footage from A New Hope. However, as a result, this film will mean far more and be enjoyed more by actual Star Wars fans rather than those who are indifferent. The aim of the screenplay is to primarily explain a missing piece of the Star Wars universe and to link up with A New Hope, not to tell a brand new story to appeal to an un-bias audience. Yet, Rogue One is undeniably entertaining with it's impressive action sequences and outstanding use of CGI. The final act is particularly spectacular as well as visually stunning with a wonderful use of colour combined with high intensity action. While the large majority of the audience will know what the ending to the film will be, the journey is unpredictable and therefore, anything goes. All areas of production are, as one would expect from a Star Wars film in 2016, superb. There has been much spoken about how the newer Star Wars films are both led by female characters and how strong the characters of Rey (portrayed by Daisy Ridley in The Force Awakens ) and Jyn Erso are. However, what is truly great about the way Star Wars has approached these characters is that they have made gender irrelevant in the creation of them. The fact that they are female in the film is not brought up at all and the respect they receive in these films are equal to that of any male counterpart. Felicity Jones is wonderful as Jyn. She brings to the character her strength as an actor and gives a heartfelt, yet stoic performance. Ben Mendelsohn also impresses as Director Orson Krennic, but it is once again a droid who steals the show. Voiced by Alan Tudyk, K-2SO is equipped with the wittiest of lines that give the film it's comedy relief, much in the same fashion that R2-D2 and C-3PO have done in the past. Rogue One successfully expands the Star Wars universe and is an utter treat for long time fans. It may not have the same power for those who are no overly familiar with the past films, but is still entertaining thanks to it's incredible visuals and original screenplay. Owning movies makes it less difficult to share. find website, to know more about officialprimewire. Amazon Instant Video and Now TV. Another disadvantage for people that like to watch absolutely free movies on the internet,click here for more info. Alternatively, you can choose to stream movies to the device on the Internet. More information on things-unseen click here. Some anime movies are often quite interesting. http://www.gerrystrumpettips.com/ has various tutorials related to new movies. Click the Upload'' button to start the upload procedure, and copy the download link following your movie was uploaded.For more details, go here sockshare. There are lots of sports streaming websites to be found on the web. After clicking on a movie, all suitable information about the movie will be displayed in a neat way and you might even watch the trailer of the movie on 9movies online.